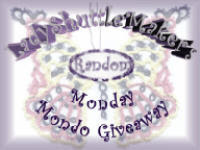 What a cool giveaway. 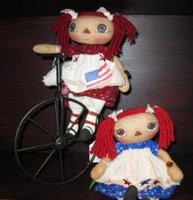 I am such a Raggedy Ann fan. I have been working on tatting related projects. No picture. I have to say I love tatting....I only like knitting. For a non knitter, here is my first try at Intarsia knitting. This technique was demonstrated on Knit and Crochet Today a while back and I thought it was very interesting. The local yarn shop offered a class, so I had to take it. I am not sure that I will want to make anything else using this technique. The many strings dangling just about drove me crazy. I think the Fair Isle technique will be more to my liking. I have not tried it, yet. But, it is supposed to be less messy while knitting. Here is my first finished square of the Great American Aran Afghan. It is called Dana Hurt. The project began in January with a new square each month. Since the yarn I chose was on backorder from Plymouth, I did not actually start my first square until April. The second square is in process. Remember, I do not claim to be a knitter. I am a TATTER!!!! I'm trying to catch up on my posting. Here is the dishcloth that I knitted for my mother for Mother's Day. It is out of cotton/linen yarn. The dishcloth says "I 'heart' You Mom". She loved it. She said, "It's too pretty to use." I could not convince her to use it. I told her it was made for her to use. Here is a better picture of the beautiful snowflake that Miranda Rensberger designed for me during the recent snowflake round robin. The previous picture did not do it justice. I recently puchased these beautiful hand dyed threads from Tatskool. I can't wait to tat them up. There have been so many posts on other blogs about how wonderful this thread is--so I had to have some. 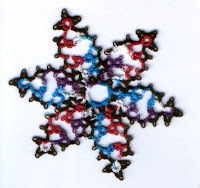 Here is the snowflake that Miranda Rensberger designed for me for the Round Robin. Wow! Isn't it georgeous. She used Lizbeth thread colors jewels and black. Miranda did a wonderful job. I am so in awe of everyone who designs. Isdihara, please leave a comment to this post that includes your email address so I can contact you.